Curious about driving an electric car? Maybe you should consider joining Communauto. The car-sharing service now has 18 electric cars available in Montreal and 7 in Quebec City; over the next few months, 25 more will be added to the network. While a small number of members had access to the cars for a trial period, these fully electric Nissan LEAF cars can now be used by any of Communauto’s 25,000 subscribers. My husband, Jonathan Levine, got to try one at the official launch in Montreal on January 16. The first thing that struck him, aside from the futuristic look and all the panels and buttons, was, well, the car’s silence. Once you get used to the electronic interface, however, Levine says it handles like a regular car. “The main difference is that it accelerates instantly,” he said. “And there’s no sound. When you’re stopped at a red light, for example, there’s no engine turning.” The car does allow you to “turn on” sound, a feature that will activate when you’re driving less than 30 km/hr so that pedestrians can hear you. A car for computer geeks? Electric cars are considered ideal for a fleet such as Communauto’s, where the cars are used mostly for short trips within the city. 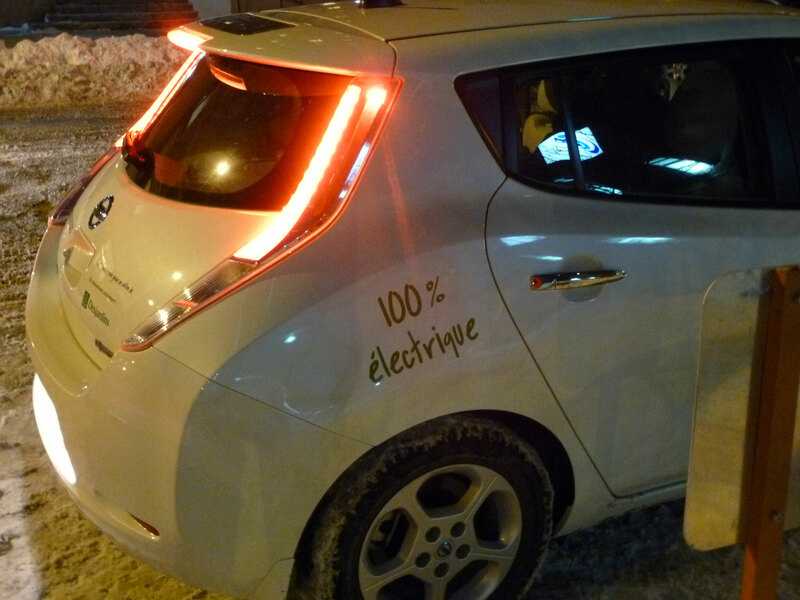 When the Nissan LEAF is fully charged, it can travel over 100 km. However, because air conditioning and heating, as well as driving habits, can greatly reduce this range, drivers are cautioned to monitor the dashboard, which continually displays the battery charge and estimated number of kilometres left. It takes 8 hours to completely recharge the car’s battery at its charging dock. At the moment, the charging docks (supplied by the Quebec firm AddÉnergie Technologies) are available only at the lots where the cars are kept. Communauto’s electric fleet has been made possible through partnerships with the Quebec government and Hydro-Québec. Attendees of Communauto’s January 16 launch also got to see the film Revenge of the Electric Car, a sequel to the award-winning Who Killed the Electric Car? by American filmmaker Chris Paine. The film will be playing at Cinema du Parc starting January 20. Now on a street near you: Communauto has added 25 all-electric Nissan LEAFs to its fleet, with 25 more to come. 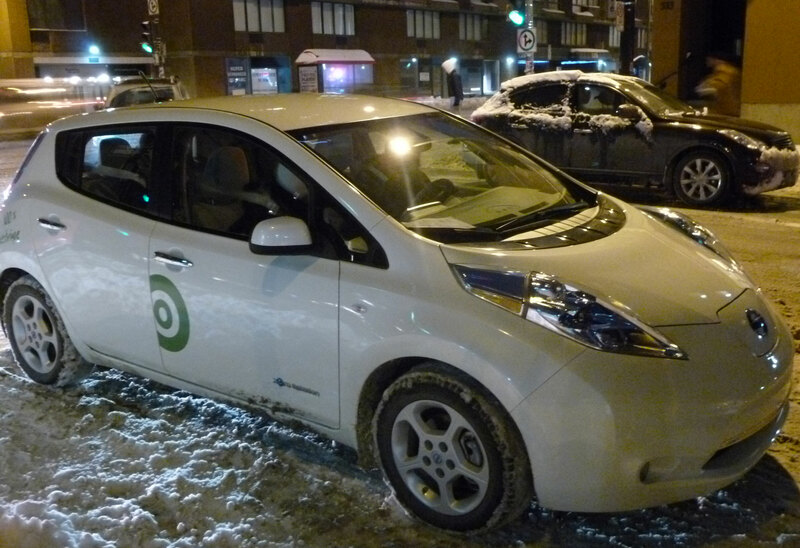 RELATED: Founding partners of The Electric Circuit — St-Hubert Restaurants, RONA, Metro, the Agence métropolitaine de transport (AMT) and Hydro-Québec — have announced the locations of 90 public charging stations to be set up this spring (2012). The five groups have teamed up to roll out a network of public charging stations in the Montreal and Quebec City areas. The Quebec government offers rebates up to $8,000 on the purchase of an electric or hybrid vehicle.